Falcon is now the least of Ford's woes: it's been overtaken by Mazda and Hyundai. Having endured speculation about the future or the fate of the Falcon, Ford as a brand is now under direct attack from import-only car makers Mazda, Hyundai and Nissan. Sales figures released this week show that while Toyota and Holden have a stranglehold on the top two positions in new-car sales, Ford, the third player among Australia's ''big three'' car manufacturers, has been bumped to fifth place. The Mazda3 cemented its position as Australia's biggest-selling car in the first three months of 2012, according to VFACTS data. But after a record start to the year, Mazda as a brand is on track to topple its former parent company Ford in the Australian market and end up third on the podium behind Toyota and Holden. Mazda sold more than 26,500 vehicles in the first quarter of 2012, setting it up for an annual tally of about 100,000 vehicles. At the same time last year, Mazda and Ford were separated by just 120 sales. Today, the gap has widened to more than 6200 vehicles in Mazda's favour. While Ford is continuing seven years of declining sales (overall sales are down by 11 per cent in the first three months of this year), Mazda sales are up 16 per cent. Hyundai has beaten Ford before on individual months but this is the first time the South Korean brand has overtaken Ford three months in a row. Meanwhile Nissan, which finished just 349 sales behind Ford in the first quarter of the year, also plans to overtake the Blue Oval. It will enter V8 Supercars next year with a new sedan called the Altima and plans to challenge the top-selling Mazda3 and Toyota Corolla with a revived Pulsar small car. ''We've set ourselves an objective to be right up the sharp end of the small segment in terms of numbers,'' says the executive general manager for national sales and fleet at Nissan Australia, Ian Moreillon. Moreillon expects the mid-size Altima to chip away at the declining large-car segment. ''The reality is we expect to get people out of Falcons and Commodores [and] into Altima,'' he says. Ford, which last led the Australian new-car market in 1997, says it will make a recovery in the second half of the year once the supply of key models improves. ''Rankings make a nice headline but satisfied customers is what we're striving for,'' says a spokesman for Ford Australia, Neil McDonald. The two shining lights in the Ford line-up are the Territory SUV (up 52 per cent) and Focus small car (up 48 per cent). But other key models have taken a hit in the wake of interruptions to supply out of flood-affected Thailand: Fiesta sales are down 27 per cent and its breadwinning pick-up, the Ranger 4x4, is down 44 per cent. Falcon, meanwhile, soldiered on with a tally of 1275 sales in March, down 24 per cent. The Holden Commodore fared better than its big sedan rival, posting 3187 sales and outselling the Cruze small car (2880) for the month and the first quarter. But Commodore sales were down by a similar percentage to Ford (22 per cent). Mazda says it is not gunning for Ford, but will sell as many cars as the market demands. ''We don't have a war room whereby we go and sit down and say, 'Right, we want to sell this [many]' … We will sell [how many cars] the market wants,'' says a spokesman for Mazda Australia, Steve Maciver. That BA ad was pretty good, even though i was about 11 at the time i distinctly remember it and couldn't wait for dad to replace his EL Fairmont with one. I also remember that AU ad in that windtunnel. The FG is a pretty decent car but all anyone is hearing about falcons is that they aren't selling. Unless you actively get off your a** and walk into a dealer you will never know anything about them. And why would you bother? with the engaging ads from Kia, subaru and mazda and even holden every now and then i wonder if ford even crosses the mind of your average punter? Of course no one buys falcons! I love the blue oval. It's funny, though. Perchance Ford sales aren't as high because people who buy Fords tend to stick with them? IE: not going out and buying a replacment every few years. But if I had to replace my car you'd better believe it would be with another falcon. I'm not entirely sure the ads are solely to blame. Sure, Fords marketing team do appear on the outer to be a useless bunch of bozo's, but TV ads or no TV ads, its the car you get for your money that sells a set of wheels. The price of a large sedan, as a portion of the average wage has risen too high for them to be a volume seller. The commodore is getting by on export and fleet purchases. 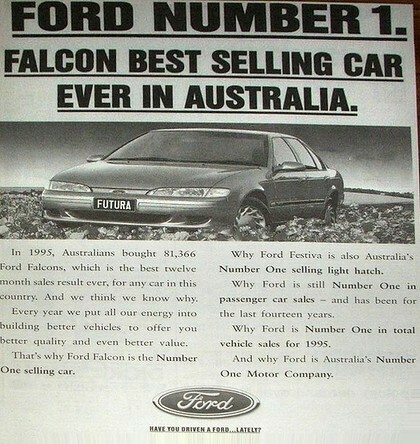 Ford probably understand the falcon is too expensive for most families to consider. The focus and the mondy will get the kids to school in much the same fashion but baseline models are much cheaper. The bigger money is being spent on Territories, while the lesser money on the small/medium sized segment. Why spend money on ads if the product is being squeezed by its bretheren? You have to face it, currently the falcon is facing an uphill battle from market forces rather than a lack of BAM-WOW slick ads. The last exclusively falcon add on tv I saw was for the 50th anniversary models. You don't even see them in the mixed model adds as they feature Fords small cars and tge territory. A smart man would assume that management has already made its descision and the bean counters are acting accordingly. In terms of pricing, I never thought I'd see the day that a base model falcon has an rrp of greater than what you can get an ex demo ss commodore for. I remember 40+k being reserved for premo models in the lineup. Look at the xr8 (and the gs) from AU to FG its been stable at low-mid 50k. It wasn't that long ago that the fairmont ghia was a 40k vehicle. Seems like car prices are going up almosr as quick as petrol prices. By the time I'm ready to buy new 60k will be the starting price. hate to say it, but the FG simply isn't a very good looking car. Its bland. The `sporty' versions are a bland car with stickers all over them. Sure, they may have good running gear (at least the Coyote engines) and there's obviously nothing wrong with the 6's and if there was nothing else out there and fuel was cheaper and the car itself was cheaper then maybe they'd sell....but fuel IS expensive and there simply ARE better cars to drop a large amount of money on. I love older Fords but the new ones don't have alot going for them. DISCLAIMER - this is obviously JUST an opinion - don't get all pissy about my comments. I don't like the looks of commodores much either and I hate to say this but they do look better than the FG. If I HAD to buy a new car I'd go for a 300C. They have become too expensive & not marketed highly enough. Ford bought out the eco-boost, now they need to market the hell out of it, as it should give the falcon a second chance look with buyers that were looking at a 4cyl family car, as long as the insurance companies don't go "ohhh turbo, must be a "performance car", better set premiums as such". Pitty they don't have a car in their lineup like the cortina, it used mostly falcon running gear & was RWD. Imagine a focus rwd with the eco-boost 4cyl. If there was such a beast, I'd que up for a test drive, and look at buying one, that's for sure. Toranaguy. There is such a car, but its not a ford. Renault know how to make a mean rwd hot hatch. Being a Reno it will be expensive to maintain too. Hell, BMW make some nice smaller RWD car's, but yet again they are expensive to maintain. A ford wouldn't be as expensive. LOL Well the AU looks like something you would hold a door open with. but it was a ok car..yes looks mater but i know a few people who think the AU's look good ( no offence guys ) but i think some more ad's would go a long way to helping ford ( i hate to say this but the holes and dents (Holdens) adds are rather cool ). I actually really like the look of the FG. They should of stuck with the 2 round lights on the front for the xr's to break em up from the rest of the pack. Fg just lost that grunt appeal, it's so sad looking. An I think all the stickers they put on are soo F*CKING GAY!!! The el xr's never had stickers and they look tough, don't know where they found these designers but I think they should go back to old school or just go back to school in general. Agree ^^^ should have kept tickford aswell .